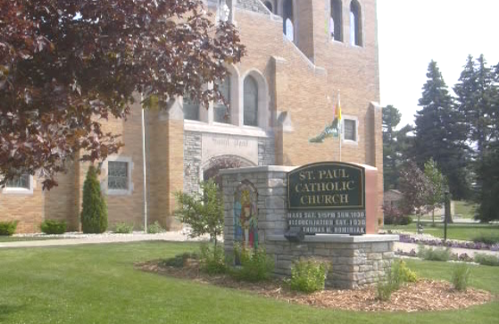 We, the parishioners of St Paul, Onaway, open to the guidance of the Holy Spirit, are dedicated to preserve, live and proclaim the Good News brought by Jesus. As a sacramental people, we are committed to welcome all into Christ's presence among us. There is One Hour Adoration / Benediction on the First Friday of each month.Also on the last full weekend of the month, one hour prior to each Mass. Confessions can be heard on Saturday's at 3:15 pm, personal appointments can be made anytime, please call 989-733-4043. Fish(Cod) Fried or Steamed, Hush Puppies, Baked Potato, Mac & Cheese, Baked Beans, Cole Slaw, Rolls, Coffee, Punch and lots of Homemade Desserts. Parish Shirts are available. Stop by the office and order yours today.